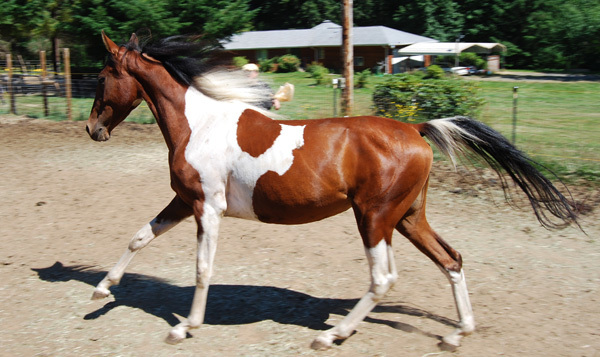 Rocket to Fame - "Emmaline"
Emmaline is an elegant bay tobiano American Saddlebred, who goes by the official name of Rocket to Fame. Double registered as a Pinto, she is a beautiful moving package all wrapped up in bay, black and white. She can claim HHP Aire Command, Wing Commander, and Rocket Shoes as ancestors. Emmaline is incredibly elegant and has the most charming personality. She has movement correct enough for sport horse disciplines, while maintaining that extra Saddlebred flair. Her multi-color mane and tail just add to her stunning beauty and presence. She adores people and always tries to help out--no matter what we're doing. 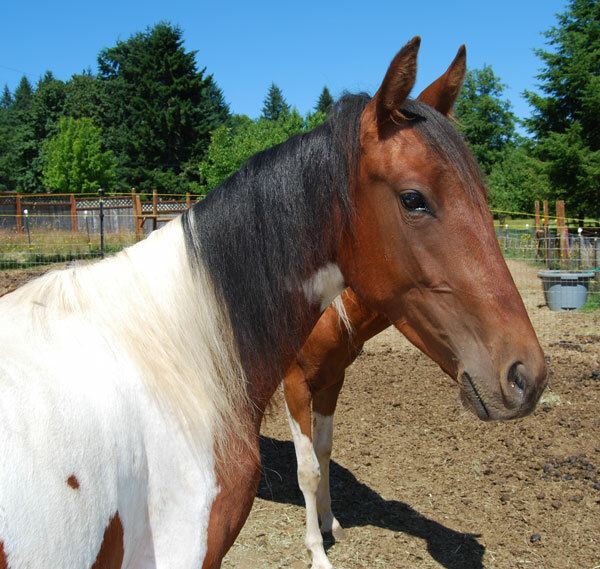 Claiming All The Fame is a tall, striking homozygous pinto black and white tobiano stallion. 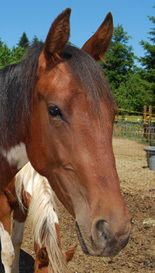 He is double registered as an American Saddlebred and a Pinto. Although young, he shows great promise and Emmaline is from his second foal crop. Soon his get will be old enough to show under saddle, and make their mark in the Saddlebred and Pinto rings. While carrying a beautiful hooked, swan neck, he doesn’t have the overlong, saggy topline and back you see in some lines. He has the kind of strength and correctness that could easily translate into sport horse classes or make for good inspection scores. Claiming All The Fame’s pedigree traces back to greats such as HHP Aire Command and Ch Wing Commander. DeDe was a three-gaited champion, and is sired by Rocket Shoes, who was a five-gaited champion. Rocket Shoes in turn was sired by World Champion harness horse, Buck Rogers. Further back is six-time World Grand Champion Five-Gaited horse, Wing Commander. Emmaline was started under saddle, but due to a stifle injury, is broodmare sound. We welcome inquiries from countries outside the United States. Please use the Bablefish Translater to see our site in another language.